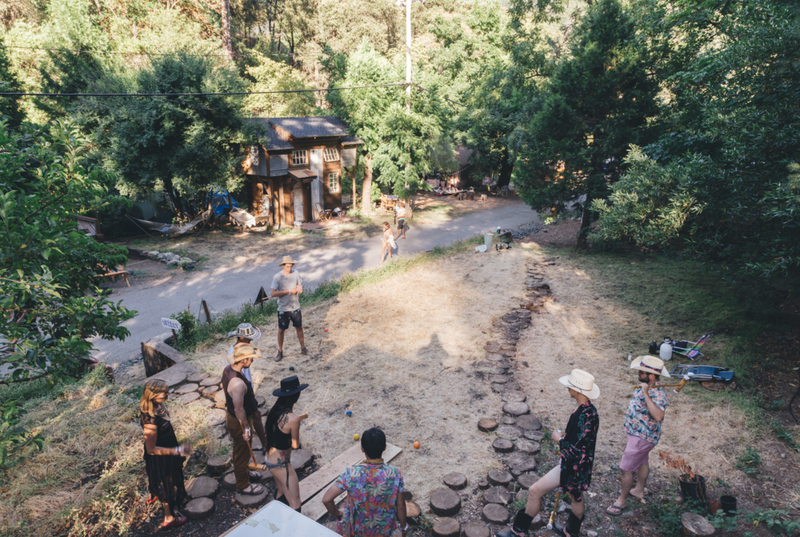 Looking for a unique space to plan a retreat, craft a celebration, or hold a workshop? The Pulga Schoolhouse can seat up to 60 people comfortably. 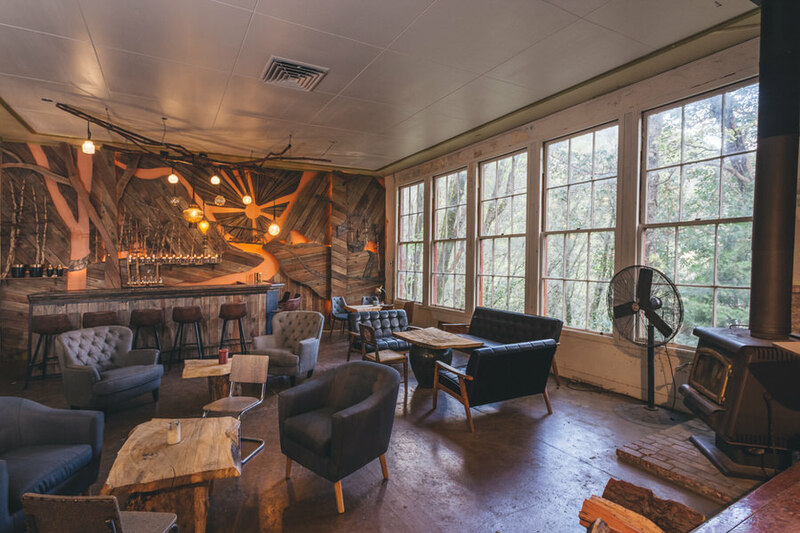 The four floor-to-ceiling windows give an interior forest-feel and overlook the large madrone trees and Feather River and tracks. 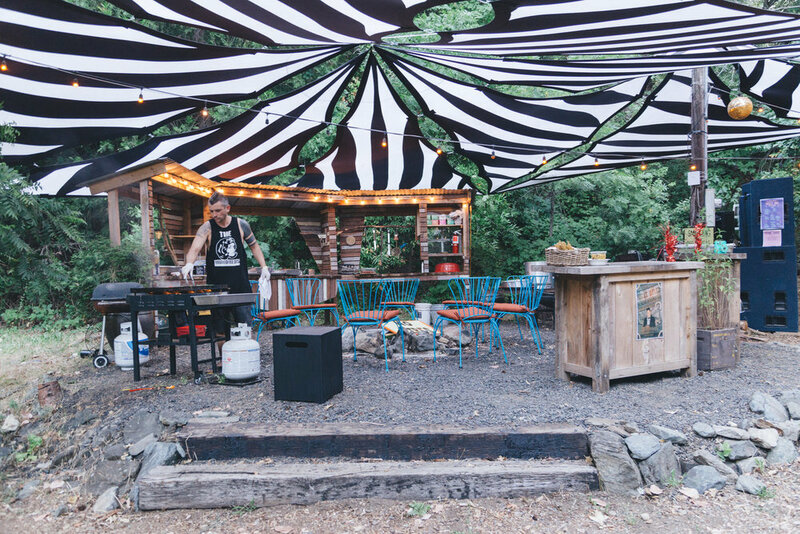 The backdrop and bar were designed by San Francisco artist and dear friend of Pulga Jesse Wilson - this 3-dimensional custom redwood installation serves to diffuse sound for loud performances, provides shelving for the bar, and will continue to evolve to reflect the growth and expansion of Pulga. 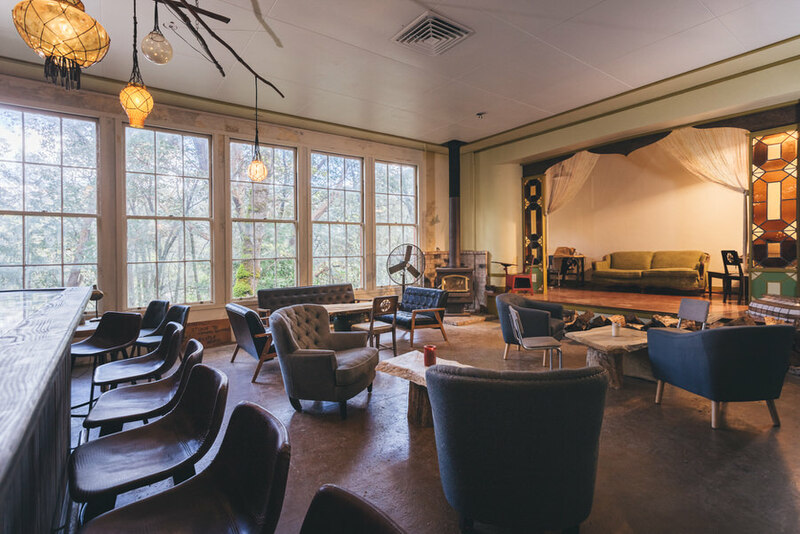 This cozy, eclectic space is sure to provide a memorable experience for guests, coworkers, or partygoers. The large wet bar, with 10 seats, can comfortably accommodate a six-person board meeting or a sixty-six-person presentation. There's an adjacent kitchen that can be used for prep and a kitchenette window once used for serving school meals under which buffet tables can be setup for group meals or snacks. Family always seems to congregate in the kitchen, and the Long House is no exception. With two full-size refrigerators, chest freezer, gas range, oven, and microwave, this cozy communal space is always open to fix a quick pour over coffee, whip up a snack, or prepare a full meal for yourself or large groups. The colonial dining table in the room adjacent to the kitchen seats 12 comfortably, and the adjoining living space provides ample lounge space with comfy couches and chairs for 12 additional guests. In colder months, warm up next to the large wood-burning stove and play a board game from the town's vintage collection. When it's warm, enjoy a cold beverage on the creekside patio. On top, The Clubhouse offers panoramic views of downtown from a spacious sundeck. 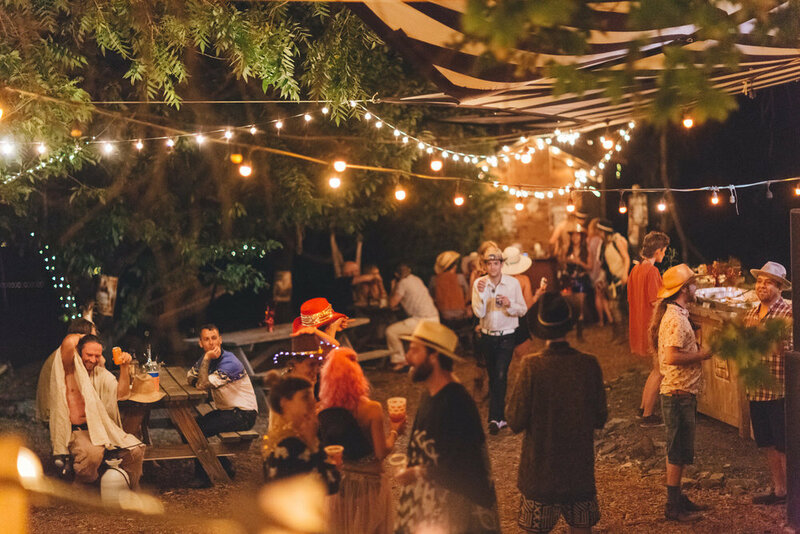 Whether you're holding a yoga class, a talent show, or a banquet, The Clubhouse is an ideal outdoor gathering space. Below, you'll find an industrial basement, often used for bar service or catering prep. It includes steel prep tables and a 3-tiered sink. 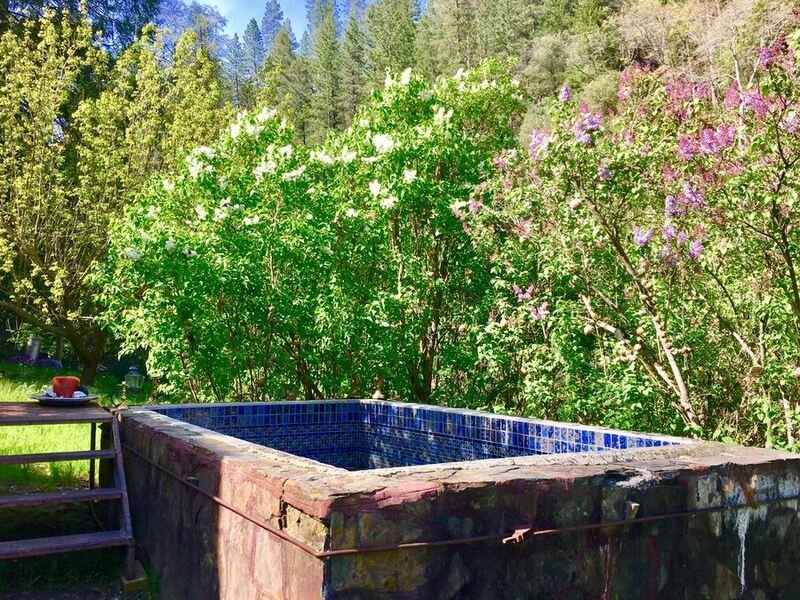 Once used to hold the native salmon and trout caught in the river downtown, this tiled stone tub is now a great place to take a morning soak, relax after a hike, or take in an exceptional star gazing eve. 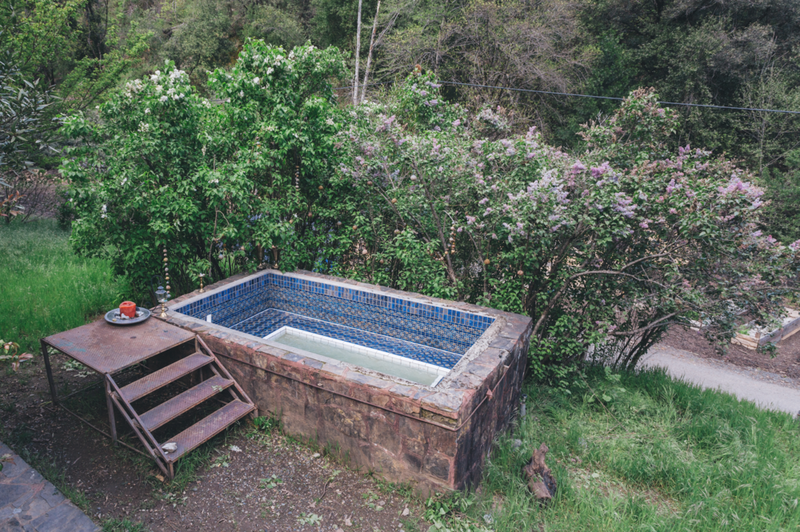 Filled halfway, the tub can accommodate 6-8 people; at full capacity, the tub comfortably seats 18.